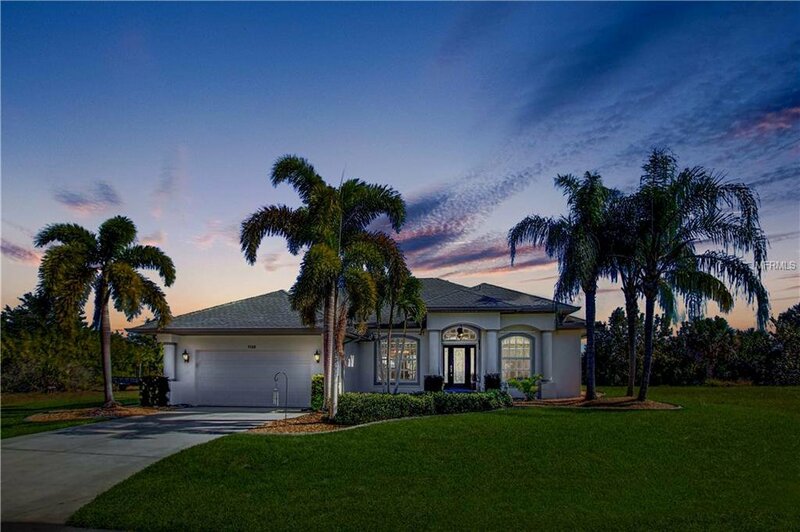 If your heart is longing to move to Florida,this home is where the heart is!! Impressive leaded glass front door welcomes you to this waterfront pool home with open,split bedroom floor plan.Newport's Picasso model was designed with waterfront views & entertaining in mind. Zero pocket sliders from the living room,great room,& master bedroom enhance the meshing of interior & exterior spaces. Open kitchen features granite counters, center island, stainless steel appliances, breakfast bar & more. Transom windows & Norman window with side flankers in family room combine with the high, cathedral ceiling lines to create a light and airy feel. Laundry room features utility sink, storage closet, shelving & lots of room for storage. The owner suite is spacious with ensuite bath featuring dual sinks, soaking tub,separate Roman shower, & his/her closets. Screened 10K gallon pebbletec finished pool/spa area hosts outdoor shower & cabana bath. Outdoor patio provides additional space for your favorite lounge chairs or grilling opportunities. Mature landscaping sits amidst curbing & encompasses the property's perimeter. Rear eastern exposure guarantees watching the full moon sparkle overhead & shine on the canal below. South Gulf Cove is a boater's paradise with over 55 miles of canals for you to enjoy. Your own 20x10 dock & 16K# lift with added water & electricity dockside makes it easy to enjoy a day on the water at a moment's notice. The discriminating buyer will want to view this home & make it your own Paradise! Listing courtesy of COLDWELL BANKER SUNSTAR REALTY. Selling Office: KW PEACE RIVER PARTNERS.